This recipe for Lingonberry and Raspberry Marzipan Tart is an excellent example of utilizing fresh and seasonal fruits in cooking. Make the pastry by mixing the flour, salt and sugar together. Then, mix the flour and butter together into it until you have a sandy texture. Combine the egg yolk and vodka together and add to the mixture. Bring together and lightly kneading it into a smooth dough. Roll out the pastry into a circular shape between two sheets of baking paper to a couple of mm thick and line the tart tin. Trim the pastry and push the sides up so they are a couple mm higher than the sides of the tin. Leave to rest in the fridge for at least 30 minutes or overnight. Line the pastry with baking paper and place baking weights, dried beans or rice in the paper. Place the tart tin onto a baking sheet and bake for 20 minutes before removing the baking paper and weights, and baking another 10 minutes. Meanwhile make the filling. Toast the blanched almonds in a dry frying pan until golden, stirring constantly for 3-4 minutes, tip out onto a plate and leave to cool. Leave to cool before blitzing the nuts with the sugar until fine in a food processor. Then add the butter, almond extract, and salt and pulse again to combine. Add the eggs and flour and pulse briefly. Spread the jam on the base of the tart. Followed by the almond paste. Place back in the oven to bake for another 30 minutes until the middle is cooked. Leave to cool. Mix together the icing sugar with a tablespoon of water, enough to make a very thick paste. 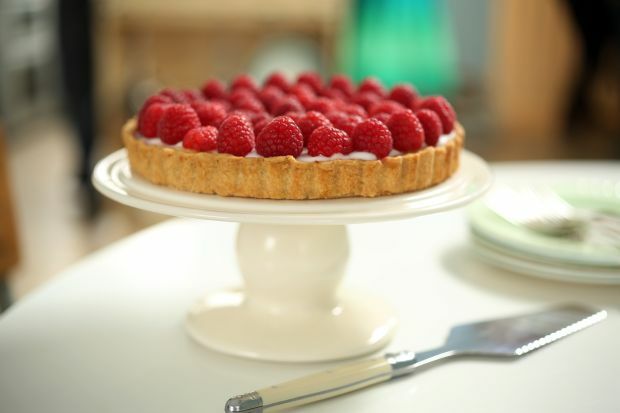 Spread on top of the tart and stick on the raspberries. If you do not want to make the pastry from scratch, you can instead use good quality pre-made buttery shortcut pastry. You can replace raspberries with other berries or slices of soft fruits like peaches and plums. Vodka prevent your pastry from shrinking when it bakes.